Almost every camera sold at B&H contains a light meter designed to calculate extremely accurate exposure readings, typically with a choice of Spot, Average, and Segmented metering modes. Good as they are, handheld light meters still have the upper hand when it comes to analyzing light. For starters, the meter in your camera only reads reflected ambient light. If you’d prefer to take an incident reading, i.e., measure the light falling onto you subject rather than reflecting off your subject, you can’t do it without having to add accessories. Your camera meter also doesn’t read flash, cine exposures, color temperature, foot-candle, or lux. Basically, unless you only shoot on perfect, sunny days, sooner or later your camera meter is going to let you down. 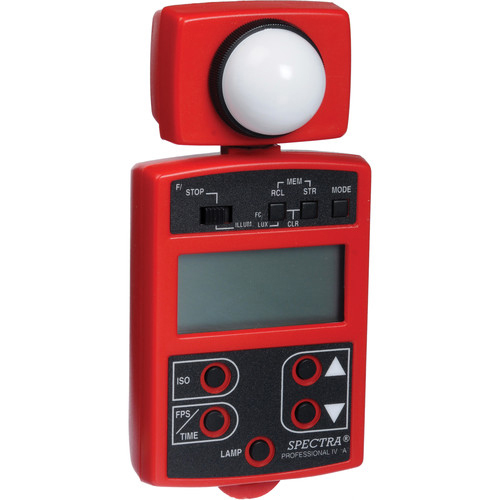 At B&H, we sell more than 60 handheld light meters from a dozen manufacturers. The following is a selection of handheld meters that go well beyond the analytical abilities of your camera’s awesome, but not-quite-perfect metering system. 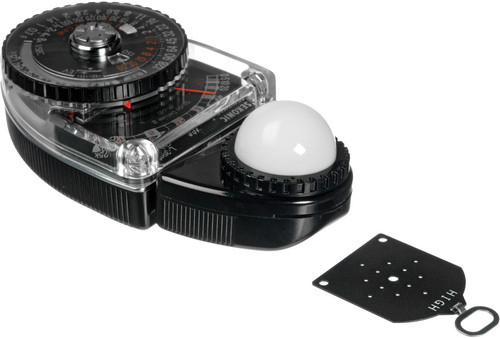 The most basic light meter is the Sekonic L-398A Studio Deluxe III, a classic analog light meter that takes incident and reflected ambient light readings. Based on a design that goes back decades, the L-398A displays readings for both stills and cine, and because it utilizes a selenium cell, it doesn’t require batteries. 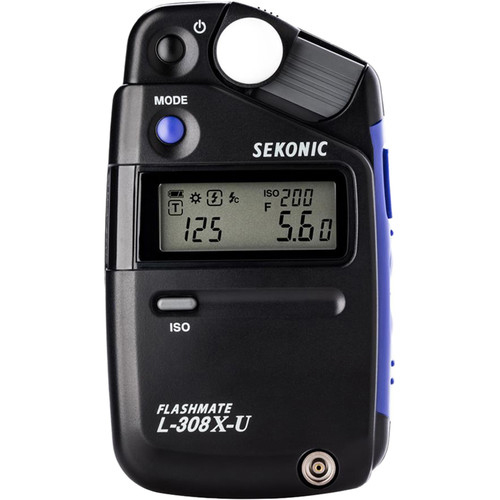 Comparably priced but thoroughly modern is Sekonic’s L-308X-U, a pocket-sized best-selling meter that captures reflected and incident flash and ambient readings along with Cine and HD Cine metering modes. The L-308X-U features weatherproof construction, a customizable backlit LCD, cord or cordless operation, and a pocket-friendly form factor. Other basic meters that will serve you well include Kenko’s KFM-1100 Auto Digi Meter and Gossen’s DigiPro F2 Flash & Ambient light meter. 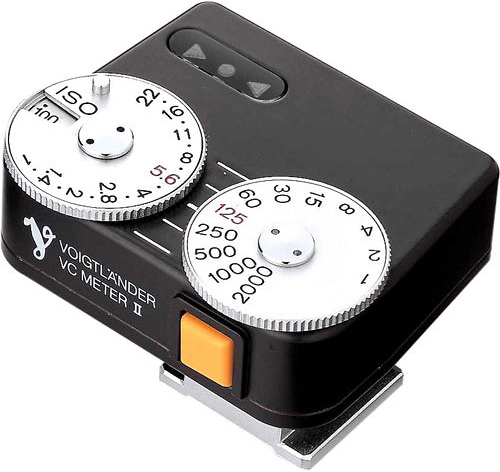 If you own a meter-less rangefinder camera or simply prefer a shoe-mounted meter, the Voigtländer VC Speed Meter II, available in silver or black, is one of the more popular reflected light meters in the genre. Flash metering, the ability to capture light readings from electronic flash heads, is a component of most handheld light meters, including three of the five basic meters mentioned above. Many flash meters include a mode that combines flash and ambient light values into a single exposure reading. The number one flash meter in my book is the Sekonic Speedmaster L-858D-U light meter which, in addition to incident and reflected flash and ambient readings, also reads 1° ambient and flash spot readings. Other features include a 2.7" touchscreen, Cine, Video, HSS Flash, and flash duration readings, a flash/ambient light analyzation function, and optional modules for dedicated use with PocketWizard and Elinchrom/Phottix flash systems. 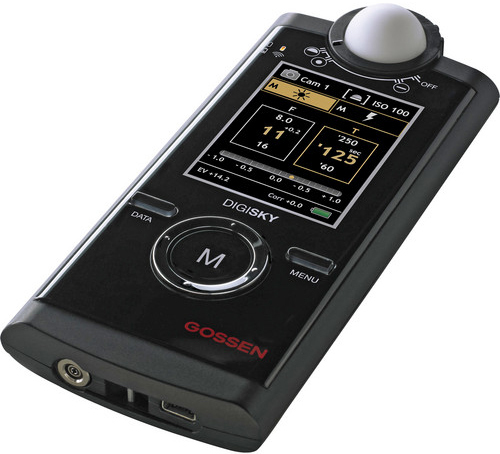 Gossen’s DIDISKY Flash & Ambient light meter, which can provide readings for incident and reflected ambient light, flash, and cine, is unique in that contains a rechargeable battery. Another neat feature is its ability to capture readings in a choice of 1/10, 1/3, ½, and full-stop increments. Sekonic’s LiteMaster Pro L-478D-U is an interesting flash meter for several reasons. In addition to incident ambient and flash readings, the L-478D-U features a filtration compensation mode, a flash analyzing function, illuminance readings, and it displays frame rates and shutter angles for cine shooters. But what’s particularly interesting about the meter is that there are models available for dedicated use with PocketWizard transceivers (Sekonic LiteMaster Pro L-478DR-U), the Phottix Strato II flash system (Sekonic LiteMaster Pro L-478DR-U-PX), and the Elinchrom EL Skyport flash system (Sekonic LiteMaster Pro L-478DR-U-EL). You say you want a decent light/flash meter but refuse to have to haul around yet another piece of gear every time you go out taking pictures? Well, if you own an iPhone or iPad you’re in luck. 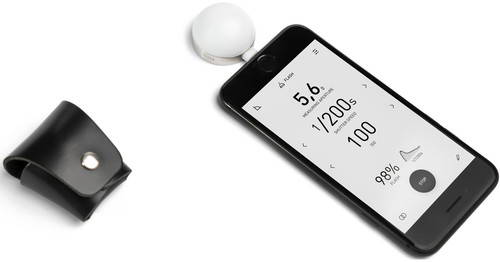 The Lumu Power Light & Color Meter for Photo and Video is a plug-in device (literally) that turns your iPhone or iPad into a surprisingly accurate light meter. In addition to ambient and flash exposures, the Lumu, which is powered by your iOS device, can read color temperature (1500K – 20,000K) and illuminance (0.15 – 250,000 Lux) and has a chromaticity mode in CIE1931/DIN 5033 color standard. Many meters facilitate taking cine readings, but select meters are cine-specific in terms of functionality. Meters of this caliber include the Spectra Cine Professional IV-A Digital meter which, in addition to the usual suspects (incident ambient, reflected ambient, foot-candles, and Lux) features frame rates (2 – 360), a wide aperture range (f/0.35 – f/128 in 10th-stop increments), and the ability to calculate contrast ratios and averages. As a bonus, for those who find black meters boring, Spectra’s Pro IV-A is also available in red, blue, and yellow. Equally sophisticated, but limited to 1° spot readings is the Spectra Cine Spot Meter System, which is also available in black, red, blue, green, and yellow. Cine meters need not be expensive, and some come disguised as entry-level meters. Sekonic’s L-398 Studio Deluxe III, L-308X-U, and the more advanced Speedmaster L-858D-U, and L-478DR-U-series meters (all described above), feature basic and advanced Cine modes. Color meters and spectrometers measure the color temperature of continuous ambient and electronic light sources. Depending on the model, color meters can read the color of daylight, tungsten, electronic flash, LED, HMI, and fluorescent light sources. Knowing the Kelvin rating (color temperature) and other characteristics of the light in which you are shooting enables you to adjust your camera settings (or filter pack) more accurately, which invariably leads to cleaner image files. A few meters can even evaluate photosynthetic photon flux (PPF), which is a method of measuring the photosynthetically active radiation levels of a light source. This may not mean much to me and you but, if you grow fruits, vegetables, or flowers for a living, you probably check your PPF readings more often than us city folk check traffic and weather reports. 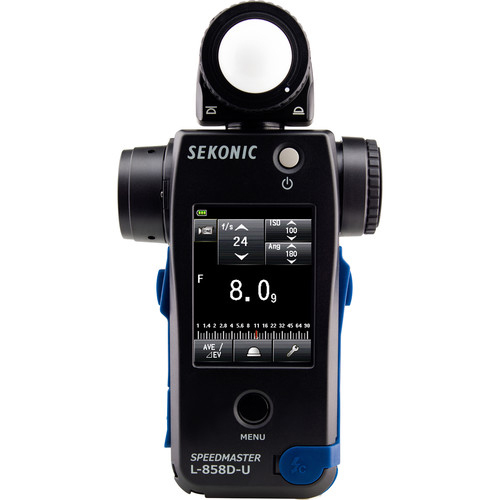 Sekonic manufactures four SpectroMaster-series color meters, the most advanced being the Sekonic C-7000 SpectroMaster, which contains a CMOS Linear imaging sensor. Designed primarily for industrial applications, the C-7000 can analyze all forms of continuous light, including correlated color temperature, Illuminance, color rendering index (CRI), tristimulus value, chromaticity coordinates (for CIE1931/CIE1964 & CIE1976 standards), peak wavelength, excitation purity, and PPF density. A 4.3" touchscreen can simultaneously display multiple informational screens. 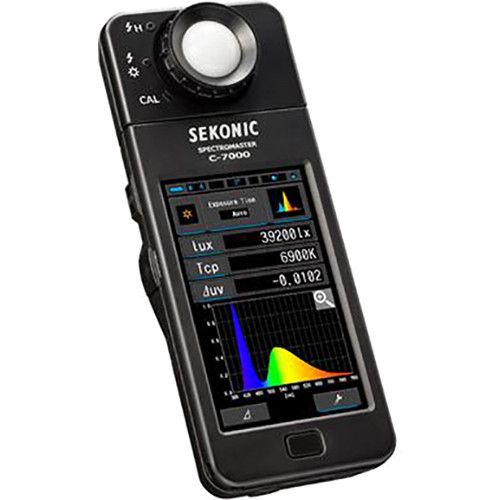 Other Sekonic color meters include the Sekonic C-800 SpectroMaster which, in addition to reading all forms of flash and continuous light, features a 4.3" touchscreen with 11 display modes, employs SSI (Spectral Similarity Index), displays CRI, SSI, TLCI, TLMF, TM-30-15 data and shows Rosco, Lee, Fujifilm and Wratten filter names. 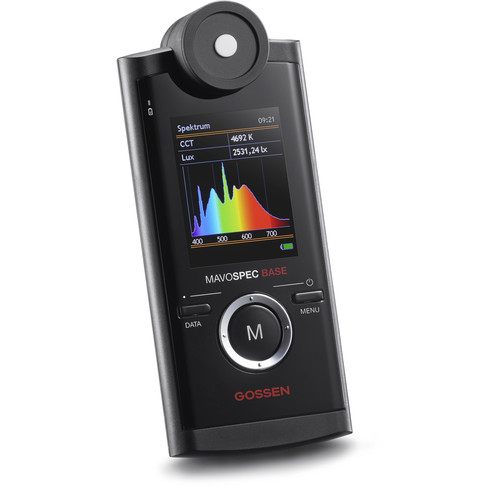 Gossen’s MAVOSPEC BASE Industrial light meter is comparable to the Sekonic C-7000. 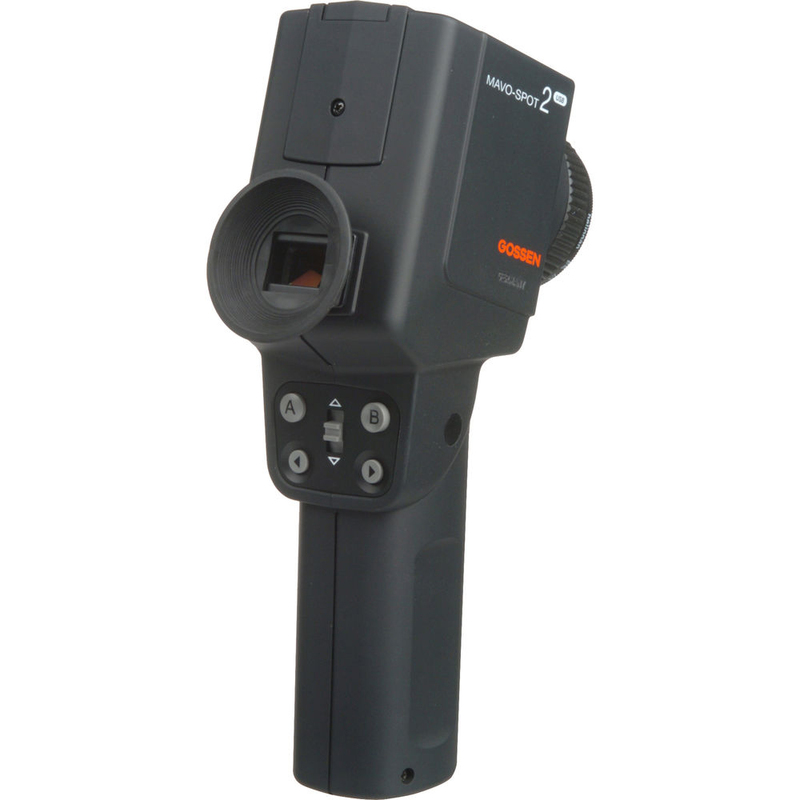 The Gossen MAVOSPEC BASE takes IES TM-30-15 Color Rendering measurements, in addition to CRI, CCT, peak wavelength, color purity, chromaticity, and flicker measurements. The iKan CV600 Chrome View spectrometer is designed for reading LED lighting. 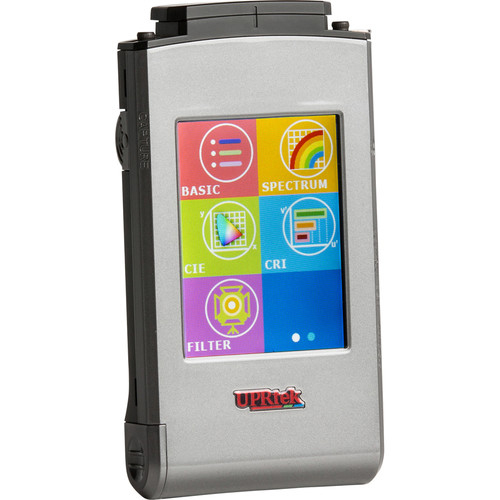 It features a 3.5" touchscreen and can measure Lux (70-70,000), wavelength (380-780nm), CT, CRI, TLCI, Flicker (up to 100 kHz/sec), EV, and T modes for exposure readings. The CV600als features a rechargeable lithium-ion battery that delivers up to 5 hours of service per charge. Many meters can take 10°, 5°, or 1° spot readings, but some meters are specifically designed to take 1° spot readings. These meters are best used for situations in which the light varies greatly throughout the scene being photographed. Rather than taking an overall exposure and letting the chips fall where they may, spot meters enable you to take readings of extremely narrow angles of view of highlight, shadow, and mid tones, which together enable you to establish exposures that give you a truer, more accurate balance of tonality. The Sekonic Speedmaster L-858D-U is a descendent of a metering system that has been steadily evolving for 20-plus years. In addition to 1° Spot Metering through an optical Viewfinder, the L-858D-U features weather-proof construction, a 2.7" LCD touchscreen, a wide range of cine and video settings, a luminance range of 0.1 to 2,000,000 lux, and HSS flash and flash duration settings. 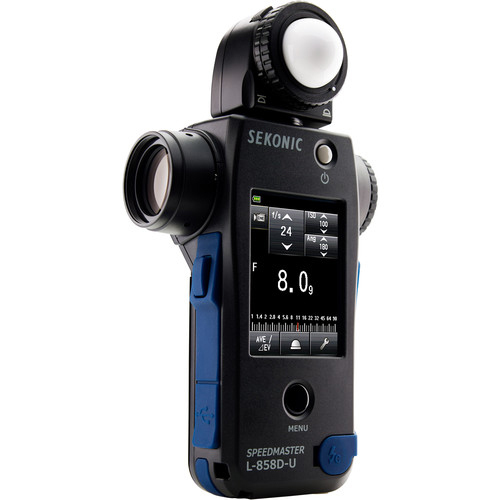 Other 1° spot meters include the Spectra Cine Cinespot One-Degree spotmeter, the Gossen Mavo-Spot 2 USB Luminance 1° Spotmeter, and the Kenko KLFM-2200 Cine & Flash meter. Foot candle and lux meters are used mostly by filmmakers because of their ability to calculate contrast ratios and average light levels. 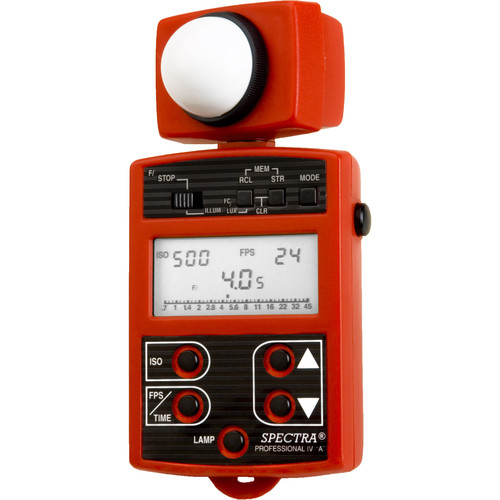 One of the more popular models is the Spectra Cine Professional IV-A digital exposure meter which, in addition to having the ability to calculate incident, reflected, foot-candle, lux readings, and frame rates, is available in a choice of black, yellow, red, blue, and green. If you ever wondered why filmmakers are always happy, it’s because the can buy light meters in a choice of bright colors. One last thing: It’s important to keep in mind that each of the abovementioned light meters is extremely accurate, many to within 1/10-stop accuracy. Just as it’s hard to find a bad camera, when used properly, every light meter sold at B&H is an accurate light meter. Do you use a handheld meter? If so, why do you prefer it over your camera’s built-in meter?